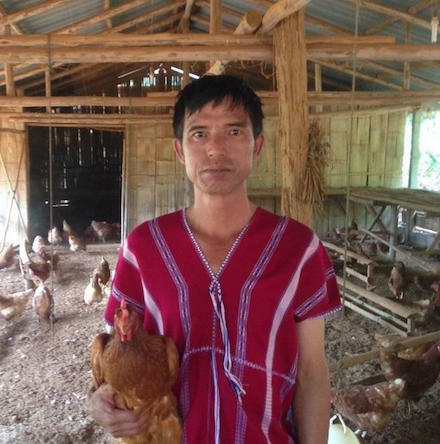 Panjai has launched an organic chicken farm in his native northern Thailand. He is now in his mid 40's, raising his three primary school-aged children at home. He is a member of the Karen tribe in Chiang Rai, Thailand, one of several different ethnic groups who make their homes across the mountain ranges of southern China, Laos, Burma, Vietnam, and Thailand. For his entire life, he has worked as a construction laborer in the mountain villages near his home. But because construction work is short-term and never guaranteed, his income is very unpredictable, and is rarely enough to support his family. He has 700 egg laying hens to raise on farmland. Selling the eggs he gets every day can potentially triple the income he makes currently. His egg farm will give him and his family a monthly source of cash in their lives, which he plans to use to send his children to study. Congratulations to Panjai in Thailand..!